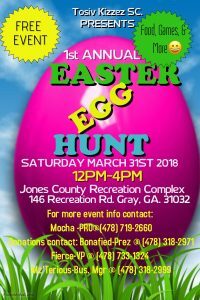 March 31st at Jones County Parks and Recreation Central Complex off of hwy 18. Good morning Jones County, we will be having a Recreational Advisory Committee meeting this Thursday @ 6pm at the Government Center. You are welcome and invited to come. We will be setting a priority list for Parks and Recreation.